Change the locks: Over the years, most home owners at one time will have had to give a key out to a neighbor or friend. Putting in new locks is the easiest way there are not keys floating around to your home! Change the alarm batteries: This ensures you know exactly how long the batteries have been used and you know exactly when to change them again. Review your home inspector’s report: Reviewing the paperwork will alert you of potential problems you might want to take care of before completely moving in, or filing the papers away. Find your circuit breaker: Find it when you first move it, so you are never trying to locate it in the dark. Deal with any water problems: Water issues can quickly evolve into mold problems. Taking care of them early ensures you do not have to deal with this later! Caulk everything: If you notice areas that could use caulking again, do it before you unpack. It is much easier this way! Plan your emergency exits: Doing this early ensures you do not put any furniture in the way if you ever needed to get out fast. Clean your gutters: While this dull task doesn’t take long, it is great to occasionally do, so you do not experience any issues with it later. Get your carpets cleaned: The easiest, cheapest and best way to clean carpets are if the rooms are completely empty. 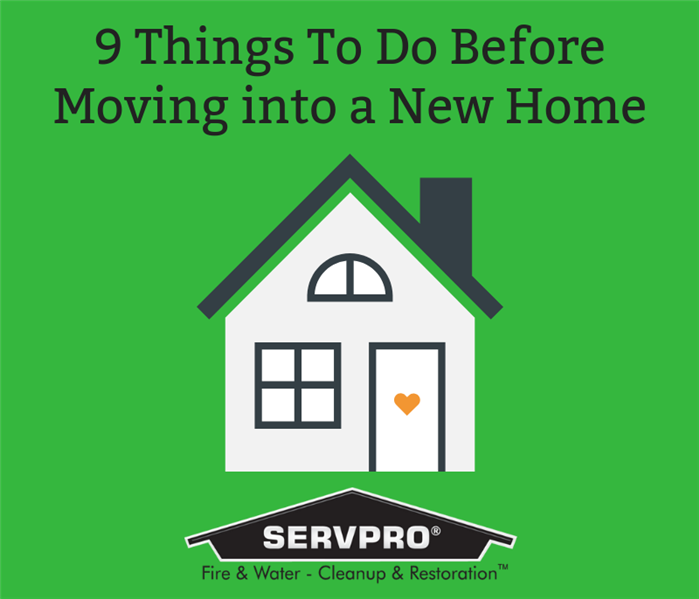 If you have time before the big move, you can schedule a cleaning ahead and have them clean and dry before you and your items arrive at the home! 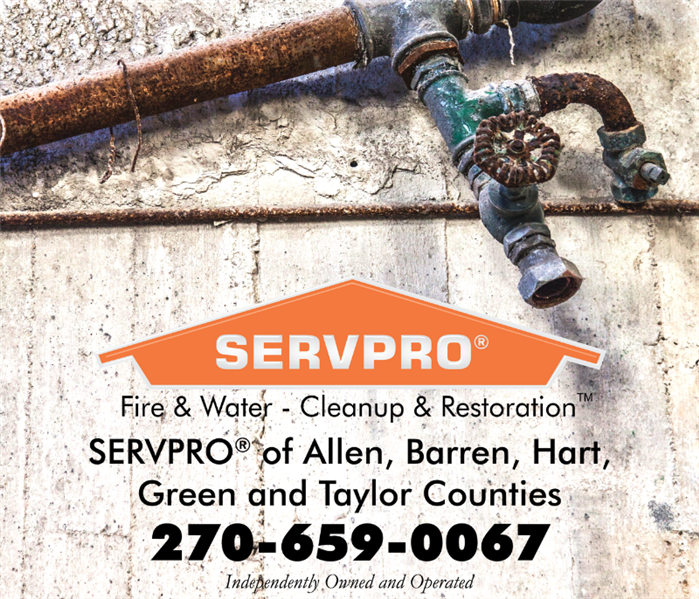 Throughout the month of April, SERVPRO of Allen, Barren, Hart, Green and Taylor Counties is focusing on promoting ALL of our services, and how we are a one-stop-shop when it comes to your home! Even though these are drastically different services, we are all ONE BRAND! This month, our representatives are handing out 3-in-1 desk cleaning tools to remind out clients that we are a one-stop-shop in all aspects. We can handle your claim or job from the beginning to the end! One thing that SERVPRO of Allen, Barren, Hart, Green and Taylor Counties can take care of is deodorizing items or things. We had an employee who had purchased a used car. After a couple of weeks, the “new car smell” wore off, and a smoke smell appeared. Being allergic to the smell of cigarette smoke, she was concerned about being in the car. We used our ozone machine to help her deodorizer. Within a few hours, the smoke smell was completely out of her car, replaced by a neutral smell. A few weeks later, the car was back to smelling like normal. A year later, the smoke smell is still gone, and the employee has still had no issues with her allergies. Many times, people are unaware of what all SERVPRO can do inhouse. If you ever have a question about if we can do something or not, give us a call at 270-659-0067 and we can have our team take a look at it! 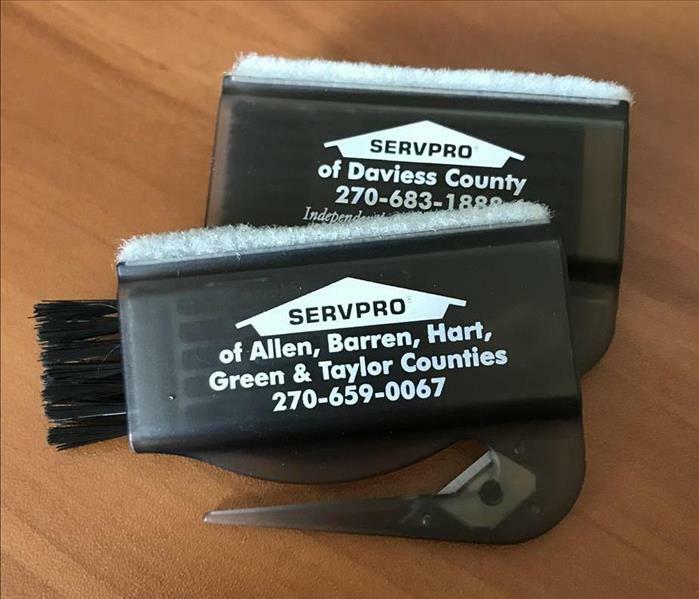 This month SERVPRO of Allen, Barren, Hart, Green and Taylor Counties is focused on educating the public on how we SAVE YOU TIME AND MONEY. We are committed to being onsite as quickly as possible when a call comes in to ensure we prevent as much damage as possible. This, in turn, can save the home owner or insurance company a lot of money. Our goal is to dry your home or business before ripping anything out. Being able to do this not only saves money, but the headache of trying to put your home back together after a loss. To remind our clients and contacts of how we are trying to SAVE time and money, our representatives are giving out Lifesavers this month! Did you know that SERVPRO of Allen, Barren, Hart, Green and Taylor Counties can also help with cleaning your vehicle? We had an employee purchase a new vehicle, and after a few days, noticed it was starting to smell like smoke. This was an issue because of her being allergic to the smell. Within a few hours we had mitigated the smell, and it was completely gone. Months later, the smell has yet to come back. We also worked on a brand-new truck where a fire extinguisher had gone off in the backseat, covering it with white powder. Overwhelmed, the owner called us for advice. We were able to get the truck completely clean and back to him within a couple of days. We have also cleaned out two police cruisers where blood was in the floor and on the seats. 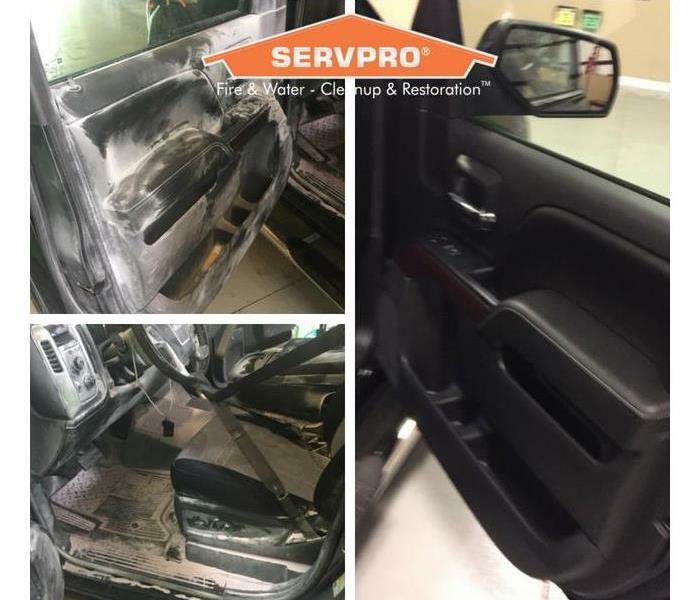 While this is not typically something you think about SERVPRO being able to take care of, remember us if you (unfortunately) have any large messes in your vehicles! Is it important to sleep with your doors closed at night? One of the things that most parents want is to be able to hear their children during the night. While this is important, it is also important to think in terms if there is a fire during the night. 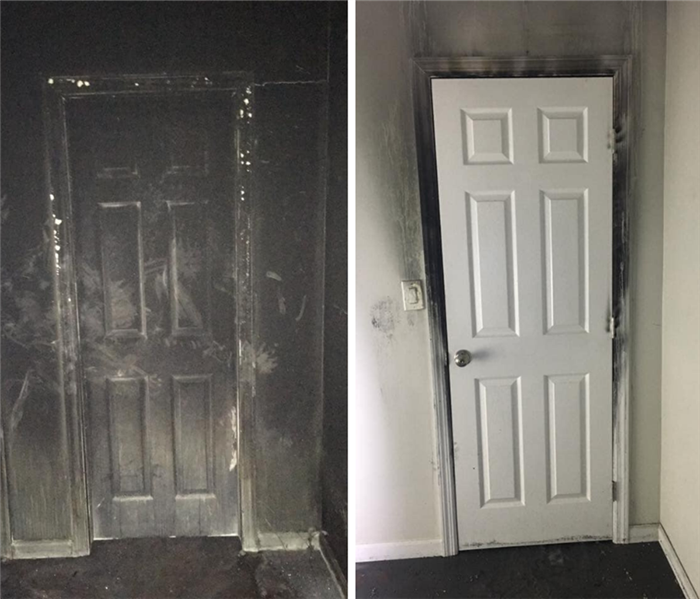 Cold Springs Harbor Fire Department in New York recently posted some photos of two doors that had been through a fire: one was completely charred, the other was only burned around the edges. The charred door was open during a house fire, while the one that was almost perfect was closed the entire time. While you might not think that closing doors can do very much, looking at this example, you can see how much it slowed down the path of the fire. Even if it bought you just a few minutes, that can be the difference between getting out unharmed or suffering from burns. With February statistically being the coldest month of the year, it is also typically one of our busiest months of the year. Knowing this ahead of time, this is the month of the year we want to focus on prevention. If you are a home or business owner, “winterizing” your properties ahead of time can prevent a lot of damage. Our Marketing Representatives are giving out hand warmers this month to remind our contacts to not only prevent building damage, but to also prevent damage to themselves. Just like our January theme, SERVPRO wants to be there when you need them. This includes being there when you are spending time outdoors prepping your properties from the cold. Hand warmers are something you might not have on hand, but having one will make your outdoor tasks a breeze! Another part of our theme for this month is the fact it’s the month of love. We want our relationship to be “NICE AND WARM” our insurance agents, contacts, customers, adjusters, and community. After the first half of winter being so mild, it was joked that we completely skipped it this year. The last week of January has shown us something completely different. With a Polar Vortex hitting the United States, temperatures have been extremely low, and in some parts of the county the wind chill has been down to -43 degrees. Schools, colleges and many businesses across the nation are having to shut down because of this cold spell. While many other businesses have been closed, SERVPRO of Allen, Barren, Hart, Green and Taylor Counties have been all hands-on deck. With this being an emergency time of the year, we always have a crew ready to assist when things go wrong. Continue to trickle water through your lines, open cabinets, and try to keep all of your water lines as warm as possible. If you do see that a pipe has frozen and busted, or is leaking water, feel free to reach out to us as quickly as possible. The sooner we are on site, the more damage we can prevent from happening! 270-659-0067. In the winter months, many people have a hard time keeping their homes or offices warm. 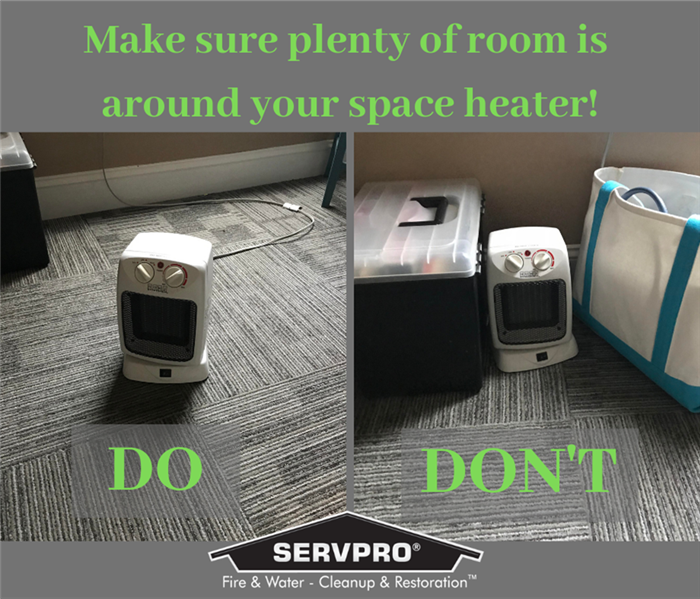 Using space heaters have become increasingly popular over the years, and often times you see them being used incorrectly. Is there anything flammable close by? Can children or pets get to it? Is there a “shut off” setting if it is tipped over? Is it on a level surface? Do not use in high traffic areas. The cord could cause a trip and if kicked, it can burn someone. We are “Green”, figuratively and literally! Most cleaning products you buy have large amounts of chemicals that can trigger health conditions, asthma and allergies when it is breathed in for long periods of time. Check your products at home, and avoid using one that contain toxins, pollutants and suspended carcinogens. Doing this can increase your air quality. When you stop using or buying products with these chemicals in them, you are down to a more natural selection. These products are not only better for your family, and also the environment. Check out companies like: Seventh Generation, JR Watkins, and Mrs. Meyer’s, which are some of the leaders in “Green” cleaning products. We provide all the cleaning products we use, so we know exactly what is in them. When we are on a job, we can also provide sheets of information about each product, so you can be sure we are sticking to our promise of being safe and ecofriendly. Along with being committed to only using products that do not impact the Earth, we also work to save as many materials as possible when it comes to any other jobs we do. Minimizing the amount of trash, and chemicals put into our environment is one of our main priorities. While we are concerned about each of our client’s health while we are cleaning, we are also concerned what these products are doing to our employees. Along with your safety, our employee’s safety is a #1 priority. If our team couldn’t be around them all day, we won’t let you either. If you have a disaster on your hands, or just need some help cleaning up, THINK GREEN and give us a call! 2/15/2019 - Is it important to sleep with your doors closed at night? 1/16/2019 - We are “Green”, figuratively and literally!